BOGNOR "BLOATER". 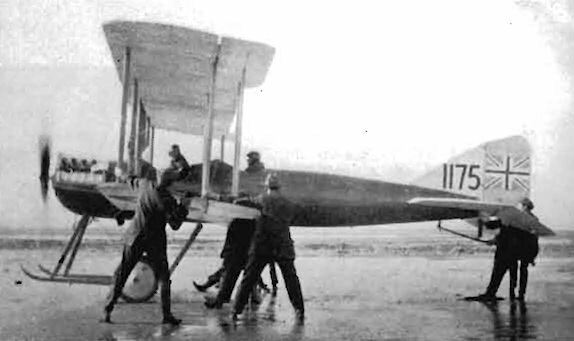 From Roger Straker of Bognor Regie, Sussex, comes this fascinating photograph of the Bognor "Bloater" - otherwise the White & Thompson Admiralty landplane of 1915. Only two photographs are extant and these were unearthed by historian J. M. Bruce. The Bloater" gained its nickname from the scaly effect created by copper wire-stitching the cedar plywood-covered monococque fuselage. Twelve were ordered for the R.N.A.S. and built by W. & T. Lid. at Bognor - testing being carried out on Middleton sands, as shown here. Power was a 70-h.p. Renault. Performance details are not known. Can any reader assist? ‘Bognor Bloater’ 1175 at its namesake. This machine operated with the Eastbourne Flying School.